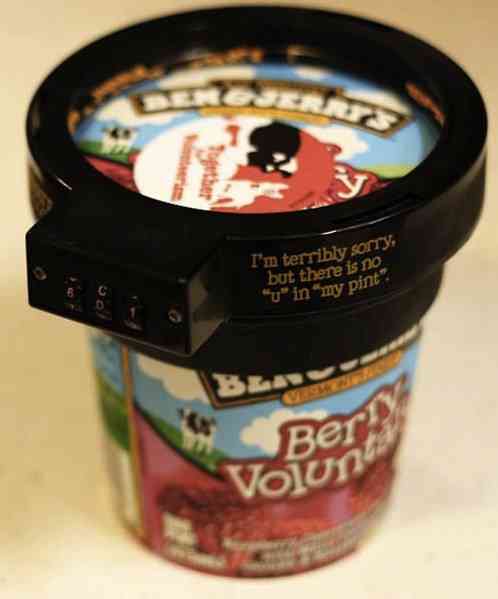 Ben & Jerry’s Euphori-Lock is a combination lock to keep other people out of your favorite pint of Ben & Jerry’s ice cream. I’m terribly sorry but there is no “u” in “my pint”. Worried the dessert desperados have their eyes on your favorite ice cream flavor? Hate to leave home for fear of cold-hearted pint-nappers? Tired of vain attempts to conceal your favorite passion behind the frozen peas? Ben & Jerry’s wants YOU to breathe easier! 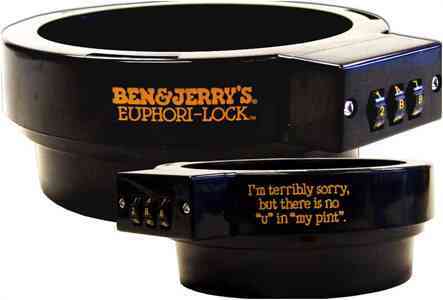 The all-new Euphori-Lock from Ben & Jerry’s is designed to promote family harmony – and salvage your peace of mind! 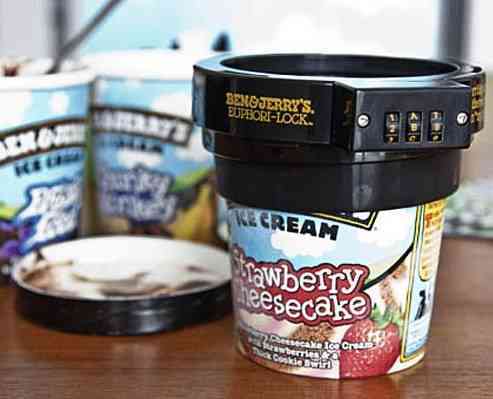 “This delightfully tongue-in-cheek concept actually came from one of our customers, who suggested we start selling our ice cream in stainless steel containers with little padlocks on them,” smiles Katie O’Brien, Ben & Jerry’s Merchandise Maven and the brains that brought Euphori-lock from delightful daydream to rugged reality. The Euphori-Lock is a tenacious two-part plastic security ring that slips around your pint’s upper lid for “udder” peace of mind. And not to worry – it comes complete with an easy-to-remember secret code when you’re ready to unlock your favorite treat!